The Subtraction micro-operation can be done easily by taking the 2's compliment of addend bits and adding it to the augend bits. Note: The 2's compliment can be obtained by taking the 1's compliment and adding one to the least significant pair of bits. The 1's compliment can be implemented with inverters, and one can be added to the sum through the input carry. 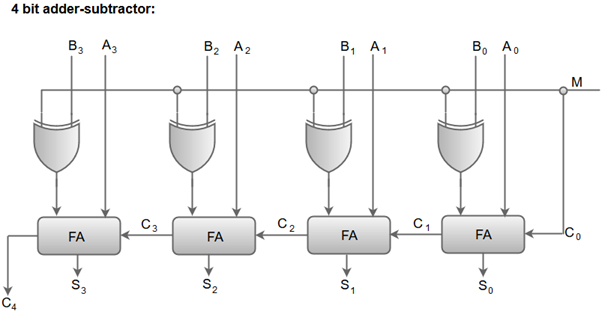 The Arithmetic micro-operations like addition and subtraction can be combined into one common circuit by including an exclusive-OR gate with each full adder. When the mode input (M) is at a low logic, i.e. '0', the circuit act as an adder and when the mode input is at a high logic, i.e. '1', the circuit act as a subtractor. The exclusive-OR gate connected in series receives input M and one of the inputs B. When M is at a low logic, we have B⊕ 0 = B. The full-adders receive the value of B, the input carry is 0, and the circuit performs A plus B. When M is at a high logic, we have B⊕ 1 = B' and C0 = 1. The B inputs are complemented, and a 1 is added through the input carry. The circuit performs the operation A plus the 2's complement of B.